Who set up Walking Stories and Why? 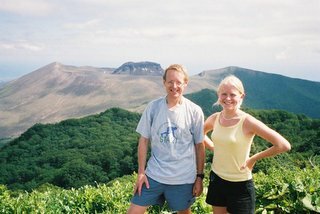 Shikotsu-ko National Park in Hokkaido, Japan, holds special significance for my daughter Catriona and myself. This is where we hatched the idea of "Walking Stories", now being developed as a website for walkers worldwide. It was early July 2003. We had just enjoyed three superb days' hillwalking around Shikotsu-ko, staying at Lapland guest house. Whilst on a bus to Chitose (Sapporo) to get a plane to Tokyo, we were thinking about how lucky we had been to stumble across such an idyllic location. Our hosts at the guest house had been great, transporting us to the start of the walks then taking us to an onsen afterwards, not to mention providing wonderful evening meals. Yet we had little idea beforehand of the practicalities involved in getting there, or of the nature of the walking. Similar situations had arisen on holidays elsewhere - in Spain and Greece for example, and even in the UK. So we talked about how useful it would be to provide a write-up in English for others who might stay at the guest house - and gradually the idea evolved into a website. A week later, after an ascent of Mount Fuji and a walk through the beautiful Kiso Valley, I lay awake one night thinking through the possibilities. I had met many friends through walking, and built up much of my life experience through travel. The site would be a way to help others to expand their horizons and share their experiences. It could also be a way of promoting sustainable tourism, particularly in rural communities. It all started with that conversation on the bus to Chitose. We have written up our walks from Lapland as a leaflet which we sent to our hosts, for future guests to read. And the website is taking shape. and all the other walks from Japan. 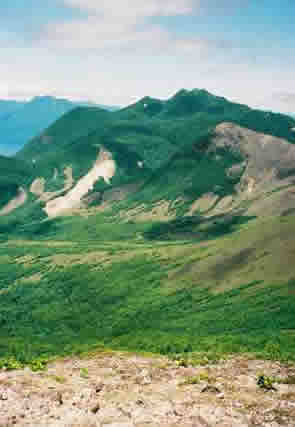 Now - July 2008 - the leaders of the world's industrial powers, the G8, are meeting in Shikotsu-Toya National Park (the Toya section). Let's hope they are similarly inspired to come up with some great ideas. Maybe they will go walking and get to know each other better.